I am a biology professor at College of the Atlantic and Chair of the Bar Harbor Marine Resources Committee. For more information on my work at COA, you can check out my website at: http://chriswpetersen.wordpress.com/. 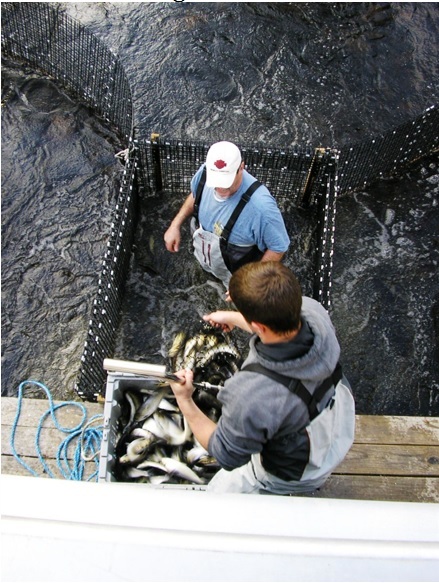 You can find out more about the Bar Harbor marine resources committee at our website at: http://www.barharbormaine.gov/xhtml/138/ViewDefault/. The Fisheries, Fishermen, and Fishing Communities class at COA is busy churning out educational and engaging blog posts all about their adventures. The latest? “Never Smelt So Good: The 16th Annual Smelt Fry and Fisheries Celebration” regales readers about the delicious smelt fry hosted by the Downeast Salmon Federation in Columbia Falls, Maine. Two local streams, Flanders Stream in Sullivan and the Somes Brook drainage that includes Long Pond and Somes Pond on MDI, have been the focus of local restoration efforts over the past several years. Newly released Maine DMR reports from volunteer counts for both rivers in 2014 showed migrating alewives similar to 2013, which was a banner year on MDI and a strong initial year after a restoration on Flanders Stream. For this report I wanted to focus on the Flanders Stream work and subsequent report written by Claire Enterline of the Maine Department of Marine Resources. We will update work on the Somesville fish run in a future report, although you can see the document written by Ms. Enterline here. Frenchman Bay Partners is working closely with both the Department of Marine Resources and the Maine Inland Fish and Wildlife Service to develop fish-run restoration projects that will have the highest impact. In the last year, the groups set up monitoring on Flanders stream and examined Jones Stream as a possible next site for restoration in the bay. Before Frenchman Bay Partners ever got started, individual partners were doing stream restoration to enhance diadromous fish populations. Sullivan resident Gary Edwards, who is now a Frenchman Bay Partner, spearheaded the Flanders Stream Alewife Restoration project, which involved opening a culvert and installing fish ladder in the stream. The project was completed this year and alewives could be seen moving up the stream in good numbers. Volunteers monitored the run, with more monitoring expected this year. FBP draws inspiration from the success of the Somes-Meynell Sanctuary’s alewife restoration work. Alewife numbers continue to increase in the Long Pond-Somes Pond watershed, with more than 37,000 fish moving upstream this year, an increase from a few hundred fish to current levels in less than ten years. This model for stream restoration shows the type of restoration possible for small coastal streams with good connections to lakes and ponds. Some FBP partners helped with the monitoring and maintenance of this constantly improving fish run. Congratulations to the Somes-Meynell Sanctuary for leading this excellent project.